Villa UJV 213, also known as Villa Anais, is located in Vitet, St Barts, with amazing views over Grand Cul de Sac, Petit Cul de Sac and St. Martin. 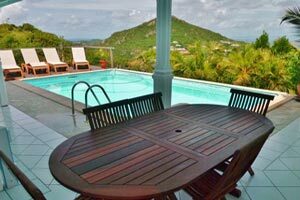 Perched on the hillside, this villa has a warm Caribbean feel to it, with several lounging areas from which to enjoy the trade winds, the sun, and the view. There are three bedrooms, two bathrooms, and two spacious living areas. The first bedroom is located on the main level and opens to the view, while the mezzanine accommodates a second, larger living area, furnished with comfortable sofas. Villa UJV 213 is ideal for friends traveling together or a family with small children looking for the perfect hideaway. This villa offers excellent levels of privacy, tranquility, and all-day sun exposure. *During the week of Thanksgiving, the villa is rented at 3 bedroom rate only.